Western blot analysis of extracts from NCI-H2228 and NCI-H3122 cells using ALK (D5F3®) XP® Rabbit mAb. Variants denoting fusions of different EML4 exons (v1 or v3) are indicated. 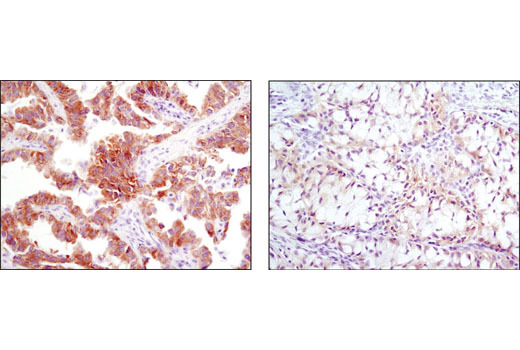 Immunohistochemical analysis of paraffin-embedded human lung carcinoma with high (left) and low levels (right) of ALK expression using ALK (D5F3®) XP® Rabbit mAb. 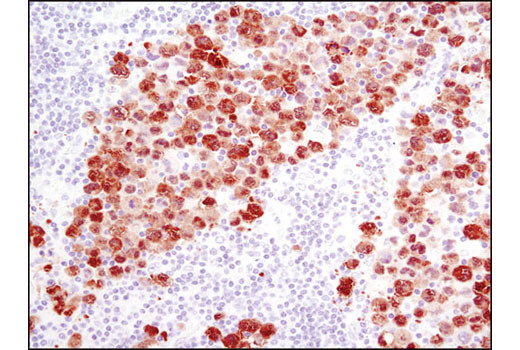 Immunohistochemical analysis of paraffin-embedded anaplastic large cell lymphoma (ALCL) using ALK (D5F3®) XP® Rabbit mAb. Flow cytometric analysis of DU 145 cells (blue) and KARPAS-299 cells (green) using ALK (D5F3®) XP® Rabbit mAb. Cell Line Source: Dr Abraham Karpas at the University of Cambridge. *IMPORTANT: See product data sheets for the appropriate antibody dilution. NOTE: This procedure describes the conditions that are recommended for the Biocare Medical Decloaking Chamber. Device-specific settings and operating instructions should be utilized for other pressure cookers. Place slides in 250 ml room temperature EDTA unmasking solution in a 24-slide holder. Place 500 ml dH2O into the pressure cooker. Place the slide holder into the pressure cooker, touching the heat shield. It may be advantageous to place a second 24-slide holder into the pressure cooker, filled with 250 ml water and blank slides. Seal the chamber and proceed with retrieval. Settings for the Biocare Medical Decloaking Chamber follow. Carefully vent the device, then remove the lid and cool the slides on the bench for 10 minutes. Rinse the slides with dH2O. Wash section in wash buffer for 5 minutes. Remove blocking solution and add 100-400 µl primary antibody diluted in SignalStain® Antibody Diluent #8112 to each section. Incubate overnight at 4°C. Remove antibody solution and wash sections in wash buffer three times for 5 minutes each. Cover section with 1-3 drops SignalStain® Boost Detection Reagent (HRP, Rabbit #8114) as needed. Incubate in a humidified chamber for 30 min at room temperature. Wash sections three times with wash buffer for 5 minutes each. Apply 100-400 µl SignalStain® DAB to each section and monitor closely. 1-10 min generally provides an acceptable staining intensity. 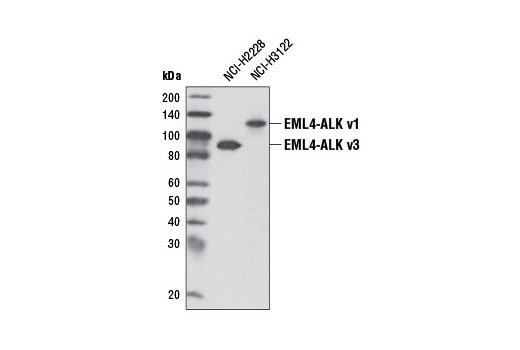 ALK (D5F3®) XP® Rabbit mAb detects endogenous levels of total ALK protein as well as ALK fusion proteins, such as EML4-ALK variants and NPM-ALK, even at low levels. This antibody does not cross-react with other family members. Monoclonal antibody is produced by immunizing animals with recombinant protein corresponding to residues in the carboxy terminus of human ALK. Anaplastic lymphoma kinase (ALK) is a tyrosine kinase receptor for pleiotrophin (PTN), a growth factor involved in embryonic brain development (1-3). 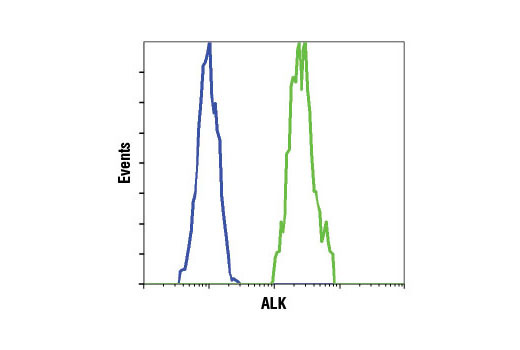 In ALK-expressing cells, PTN induces phosphorylation of both ALK and the downstream effectors IRS-1, Shc, PLCγ, and PI3 kinase (1). ALK was originally discovered as a nucleophosmin (NPM)-ALK fusion protein produced by a translocation (4). Investigators have found that the NPM-ALK fusion protein is a constitutively active, oncogenic tyrosine kinase associated with anaplastic lymphoma (4). Research literature suggests that activation of PLCγ by NPM-ALK may be a crucial step for its mitogenic activity and involved in the pathogenesis of anaplastic lymphomas (5). A distinct ALK oncogenic fusion protein involving ALK and echinoderm microtubule-associated protein like 4 (EML4) has been described in the research literature from a non-small cell lung cancer (NSCLC) cell line, with corresponding fusion transcripts present in some cases of lung adenocarcinoma. The short, amino-terminal region of the microtubule-associated protein EML4 is fused to the kinase domain of ALK (6-8). Investigators have identified ALK translocations with other fusion partners, such as TRK-fused gene (TFG) and KIF5B, which have also been associated with NSCLC (6,7). In particular, the EML4-ALK fusion protein has been found in 3-7% of NSCLC samples (6-14). Stoica, G.E. et al. (2001) J Biol Chem 276, 16772-9. Iwahara, T. et al. (1997) Oncogene 14, 439-49. Morris, S.W. et al. (1997) Oncogene 14, 2175-88. Morris, S.W. et al. (1994) Science 263, 1281-4. Bai, R.Y. et al. (1998) Mol Cell Biol 18, 6951-61. Rikova, K. et al. (2007) Cell 131, 1190-203. Takeuchi, K. et al. (2008) Clin Cancer Res 14, 6618-24. Soda, M. et al. (2007) Nature 448, 561-6. Mino-Kenudson, M. et al. (2010) Clin Cancer Res 16, 1561-71. Kwak, E.L. et al. (2010) N Engl J Med 363, 1693-703. Takeuchi, K. et al. (2009) Clin Cancer Res 15, 3143-9. Palmer, R.H. et al. (2009) Biochem J 420, 345-61. Horn, L. and Pao, W. (2009) J Clin Oncol 27, 4232-5. Rodig, S.J. et al. (2009) Clin Cancer Res 15, 5216-23. D5F3 is a registered trademark of Cell Signaling Technology. Inc.